JHN&G has a good article about a soon-to-be released study on the impact CWD will have on the Jackson elk herd. Tom Hobbs, the lead author of the study, recently presented some of his findings to a CWD symposium hosted by the National Elk Refuge. Mr. Hobbs was not optimistic. Good article. It is remarkable that we are only now belatedly seeing research done on the likely effects of CWD on the Jackson elk herd. CWD is literally on the doorstep of the Jackson elk herd having recently been found in a deer just 10 miles from Yellowstone’s east gate, and another 12 miles north of Dubois, WY. For decades now, WGFD has had its head in the sand regarding CWD, but finally they seem to be coming to a realization that, while their options are limited, something must be done. So far that mainly means increasing surveillance, and that isn’t enough. Mr. Hobbs’ conclusion is that the only real option is spreading the elk out, that is, don’t concentrate them by supplemental feeding on winter feedgrounds. That is good advice. Another good piece of advice is to recognize that large predators are our friends when it comes to CWD. Not only do predators help to spread out the ungulates susceptible to CWD, they will target and kill many of the infected animals long before their illness becomes apparent to people, even wildlife professionals. Prions, the infectious agent that causes CWD, persist in the environment for many years. A CWD infected animal sheds prions into the environment for up to 18 months as it migrates through the landscape before it dies. 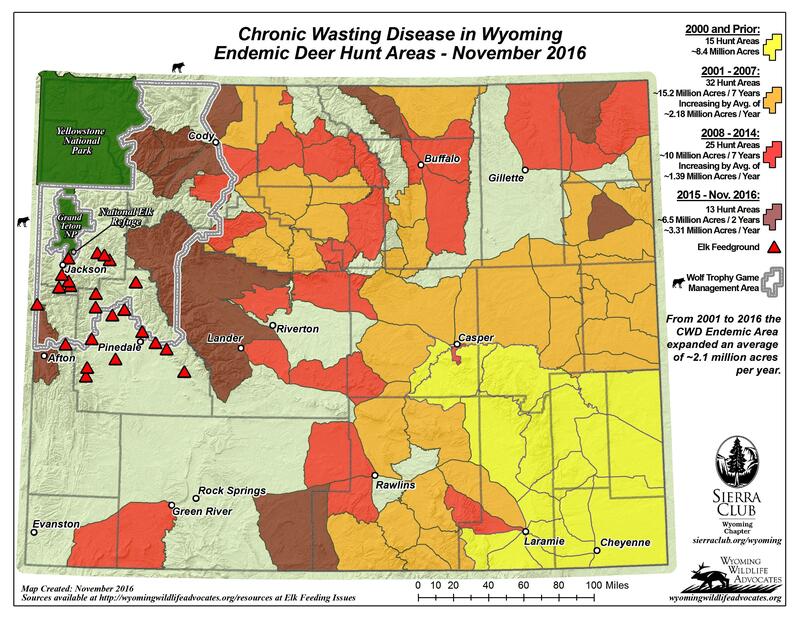 This is an area that lacks serious study but common sense would seem to indicate that having an CWD infected deer or elk killed by a predator sooner, rather than dying a natural death later, reduces the amount and spread of infectious prions. Of course, as is the pattern of Game and Fish agencies nearly everywhere, when CWD gets into our herds, the knee-jerk reaction will likely be to kill the very predators that are the front line of mitigation against CWD. The incentives built into our current wildlife management system virtually guarantee this sort of counterproductive reaction. Wyoming has had a long history of vilifying predators. That must end. Science is leading the way, but the ingrained prejudices of a lifetime die hard. The closer we can come to a natural balance between predator and prey, the better for deer and elk, and the better for us humans. Ending supplemental feeding and fostering a more natural balance between predator and prey are the two most viable strategies to mitigate CWD’s impending advance into the Jackson elk herd, and henceforth into Yellowstone National Park and beyond.